Welcome back readers! 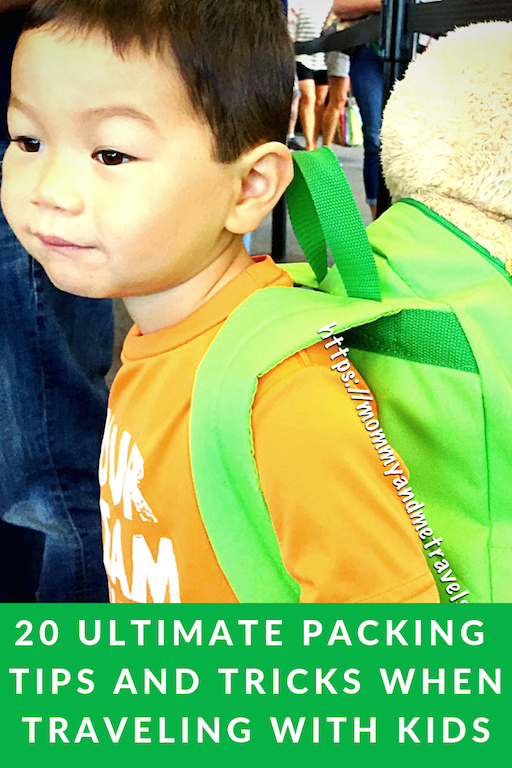 This week our Travel Mommy Experts are focusing on the 20 ultimate packing tips and tricks for traveling with kids. These amazing international family travel bloggers have been sharing with us tips for traveling with kids over the last several weeks. If you missed any, check out: how to start planning your family vacation, how to save money on transportation, best way to choose family accommodations, and Sightseeing With Kids: Tips and Tricks. This week (5), Mommy And Me Travels is excited to bring you the 20 Ultimate Packing Tips and Tricks list for your needs when traveling with kids! We are going to break up the contributions into 5 categories with the top 4 tips for each category. That means you are getting the top 20 must know packing list for traveling with kids. Without further ado, let’s check out these tips. When we start packing the first thing most people think of is their clothes and toiletries needs. At Mommy And Me Travels, we always ensure that one of the first things we pack is a small first aid kit. This will save us a ton of headaches (no pun intended) during our travels. It is always better to error on the side of caution and have one and not need it, than to need it and not have one. “…Our luggage always has a medicine kit for the most common health issues you can encounter while traveling. One issue that I don’t want to deal with is figuring out where the pharmacy is in an unfamiliar place. Not to mention, if they even carry the medicine that I am used to. It even gets more complicated when you are traveling abroad, where the medicine might be prohibited or carried in a different formulation. Set aside at least one packing cube for this. Make sure that if you are bringing a prescription-strength medication to bring a copy of the prescription with you. This is necessary during inspections in airport checkpoints, for example.” – Yamy provides her Staying Fit For Travel OTC Remedies here. 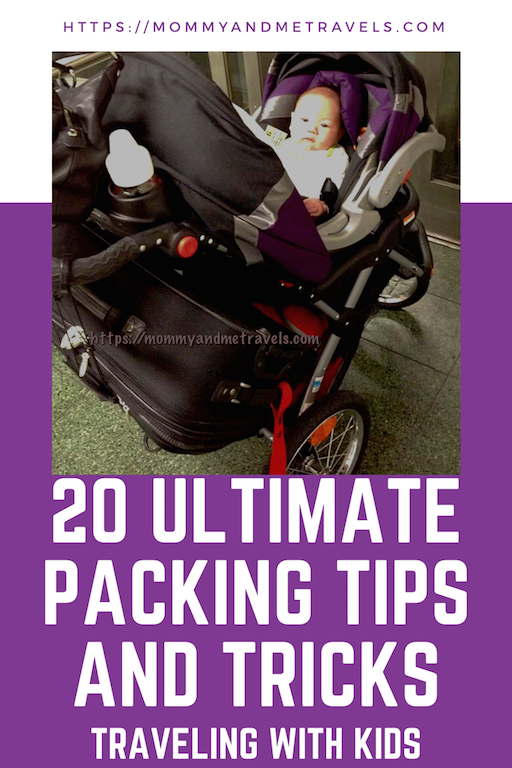 Next, let’s focus on how to travel light and the things that you need to know to implement all of our 20 ultimate packing tips and tricks when traveling with kids. To check a bag or not to check a bag? If you are like me, that is a continual battle. As airlines continue to add fees for everything, the largest cost is still a checked bag. No worries, you normally can get away with just a carryon for everyone. How you might ask, well that is the first 4 tips and tricks in our 20 ultimate packing list that we are going to share with you today. I’m sure you are now thinking, “Great, how do I fit all of my items into a carry-on bag?”. Don’t stress, our next section is going to improve your packing tips and tricks with our secrets for using packing cubes. Have you heard about Packing Cubes? I’m sure if you have read any articles about how to pack for a vacation you have read about packing cubes. You might ask what all of the hype is about and are they really worth the investment. At Mommy And Me Travels we use packing cubes for ALL of our trips, even for a short overnight local get away (you can see our recommended ones in the “Shop With Us” area below). Here are 4 ideas to help you pick your right packing cubes. Buy different color packing cubes. I usually can get our assigned clothing list (list in kids packing tricks and tips section) into one cube per person. The medium/large cubes are great for the adults and then as you can use the small/extra small for the kid’s items. I love packing cubes because I quickly can locate each person’s clothes and not have to pull everything out of the bag to locate that one item that is hiding at the bottom. 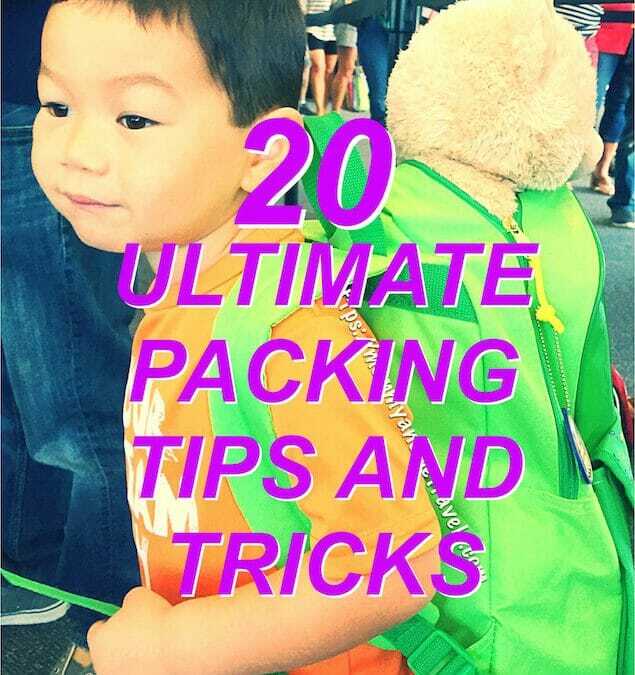 Now that we have covered packing cubes and how they are part of the 20 Ultimate Packing Tips and Tricks guide, let’s see how you can use these wonderful devices to get the kids involved in packing. Get the kids involved in packing for an upcoming trip. This teaches them great life lessons that they will be able to continue to develop as they grow. Not to mention, this will help alleviate the fights of them not wanting to wear something that mom or dad packed. Let’s hear how some of our mommies have their kids help with packing. I like to give a list to my kids and have them pick out their favorites of these items on the list. Here is our quick hitting 1 week packing list for each person that I print and provide to my kiddos: 2 (maybe 3) pairs of pants/shorts, 4 shirts, 7 pairs of underwear, 1 swimsuit, 7 pairs of socks. Some might think, no way can we pack so little. Remember most of the time you will be doing different activities so you can wear those pair of jeans more than once. And, if they do get dirty, just wash them in the sink or the bathtub. You can easily hand wash the clothes and hang them to dry. Viola, clean clothes! “…Teaching kids to pack for an entire trip, regardless of length or destination in just a carry on is doable! I’ve used the same checklist for nearly 15 years and it has never failed me (or the rest of the family). It’s simple and easy enough for most 7-year-olds to do practically by themselves. The key is to give the kids the list and let them create their ‘outfit piles’ according to the list. Then, before it all goes in the carry-on, it is checked by an adult. Finally, outfits are put into a zipper-lock bag and it’s done! This method has worked so well for our family that we have been able to pack for 3 weeks in Switzerland (in the winter) using just a carry-on and backpack!” – You can check out Shannan’s full packing tutorial at https://www.captivatingcompass.com/packing-with-kids/. Get the kids involved early and often to build a packing foundation that will last a lifetime. They will learn from you and be able to pass on their own ultimate packing tips and tricks to their children. To wrap up our tips, let’s focus on what you need to prepare for your destination. Here are some tried and true packing tips and tricks that have helped all of us mommies sleep better the night before a vacation because we know what to expect when we get our next adventurous vacation. In today’s environment there are many many many ways to find compact items of everything you need to travel with kids. One thing we love to do is take our Midfold car seat on trips. This car seat is so compact that it just tucks right into our luggage and we don’t think about it till we get off the plane. This allows our son to be safe no matter what form of transportation we are using on the ground. (You can find more about it in the “Shop With Us” area below. I always travel with a first aid kit. My friends always said I was the mom of the group because of it. I couldn’t tell you how many times we used it. It really came in handy. Thank you so much for your traveling tips! I find it hard to travel with my girls but I bet that all your tips will make my life easier! Thank you so much for sharing! Love these tips! Packing cubes are amazing! (Especially when you’re packing for kiddos too). Love the idea about the first aid cube. Great tips! I’m going to try to get the kids involved next time! These are some amazing tips and tricks to pack light specially when travelling with kids. One thing which I feel is very important to carry is the first aid box along with the essential documents like passport and visa. Wow, so much useful information on packing. Generally, packing is the skill I want to master. Not so long ago I was feeling that I’ve already done this (I was taking minimum stuff with me wherever I go and was buying necessary things at the destination when needed). However, during my last two trips, I saw that my packing was done not as good as I was expected. So, either it is that I forgot the skill or I have never really mastered it 🙂 In any case, making notes of these tips and will use them next time I am going somewhere. This is great list of tips for traveling with kids. I have never heard of Packing Cubes before, but after I looked them up I love them! Thanks for the information! First aid kit is definitely a must when traveling with kids. Also, I swear by an umbrella stroller when travelling with my toddler. We have learned that, as long as we have the space, it helps to pack each kid’s clothes in their own bag. We have small, soft-sided bags that fit inside our suitcase, and it helps to have their clothes separated when we get somewhere. Great tips. We have in each of our cars a small first aid kit that we keep up to date (those alcohol wipes dry up). We don’t fly (I love driving) and I still make sure we pack light….hauling all those bags into the hotel or wherever we are staying is ugh! Love these tips!